Choosing the speakers and amplifiers for a production can be a daunting task. However, some general guidelines can make the job a lot easier. Firstly, don't over-design the system. If the system is only going to be playing crickets chirping for two hours, the largest most incredible bass drivers are not going to help one bit. However, if very loud effects that are intented to scare the audience and shake their seats are needed, a single pair of studio monitors isn't going to do the job. A good place to start is determining the nature of the sound to be reproduced. Determine if they're to be reproduced very loudly or if they're quiet and more in the background. Next, determine if any sort of multi-channel scheme is going to be used. Many successful systems have been run in mono (single channel), but don't discount the interesting possibilities of a multi-channel system. Systems with up to eight discrete channels have been used at WPI with relative success. Having discrete channels means that speakers can be located at various positions in the hall or on stage, with the ability to have sound effects come only out of individual speakers or combinations of speakers. This can make sound appear to come from different locations. Once these decisions have been made, speakers should be chosen. If mostly quiet effects need to be reproduced, small speakers such as the Bose 101 or the JBL Control-1 can be used. These speakers are small and easy to mount in various locations. They sound decent for their size, but don't reproduce bass frequencies particularly well because they are small. If very loud sound effects are desired, larger speakers should be used. Two-way and three-way speakers by JBL and other companies work reasonably well for a medium to large sound system, while large concert stacks manufactured by EAW and several other companies work well for very large sound systems. Often components can be mixed and matched with good results, especially in a multi-channel system. For example, a set of medium-sized 3-way speakers can be used as the main sources of sound, supplemented with a couple pairs of small speakers for surround channels. Additionally, the bass units from a large concert rig may be used as modules to enhance the bass response of the entire system. 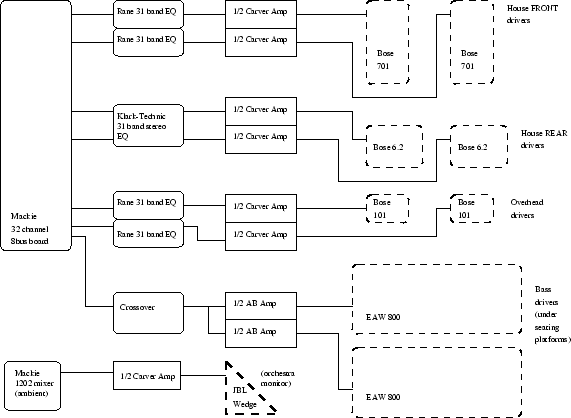 Figure 6.17: A diagram of the output section of the audio system, designed by the author for the 1995 WPI Masque production of King Henry V.
Once the particular types of speakers have been chosen, their locations need to be specified. Speaker placement is largely dependent on several factors such as speaker design, how the audience seating is arranged, etc. Factors such as directionality and dispersion of the speakers should be taken into account. 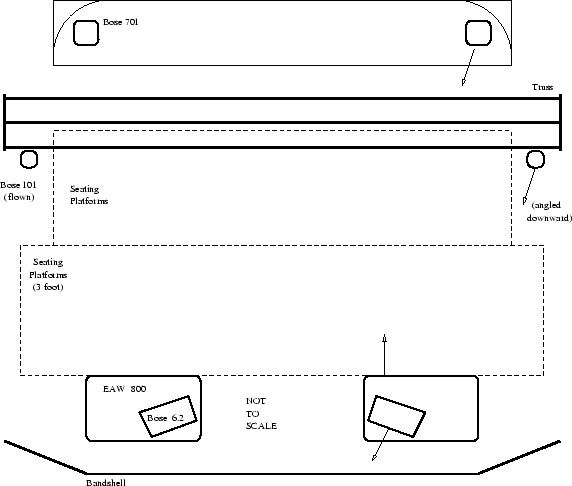 The physics of speaker placement are fairly complex, and will not be discussed in detail here. In general, though, the overall goal is to make everyone sitting in the audience hear the sound effects and/or music and not lose the voices of the actors on the stage. Figure 6.18: A plot of the speaker setup for the 1995 WPI Masque production of King Henry V, designed by the author.